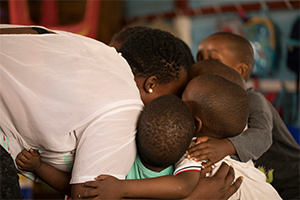 Ithemba Labantwana, which means hope for orphaned and vulnerable children, does just that in Alexandra using a family-based care model to restore their dignity. Currently working with 30 families as well as several abandoned children, Ithemba Labantwana focuses on children’s most basic needs, providing them with the foundation to grow and thrive, despite their often tragic circumstances. Meeting these basic needs includes home visits with the families to strengthen the relationships, providing parenting skills to the care-givers, sending a food parcel home at least once a month, access to counselling as well as the other programmes run by Rays of Hope, or engaging with the authorities to secure the official documentation that will give them access to state facilities or grants. The programme also runs three after-school programmes, including a homework club for children from Grade R to Grade 10, and boys’ and girls’ support groups which support teenagers as they navigate young adulthood in Alex. Tutors are needed to help children with reading and homework during the week in the afternoons from Monday to Thursday, 15:00-16:30. Stationery and art supplies, etc. are also very much needed. Are you an employer who is willing to provide entry level jobs for young people to enter the working world? Our young people are ready for the opportunity you can provide! We need people with any skills and expertise to pass on to the youth and families. We need people who can connect us with people who might grab these opportunities. Help us feed these children and families by filling a Rays of Hope bucket, monthly, with non-perishable food, or supply fruits and vegetables for our food parcels. Everybody loves celebrating birthdays, and birthday cakes or cupcakes, and / or small gifts are given often so that each child can celebrate their birthday. We’re always on the lookout for handy(wo)men who can do general repair work on the homes and facilities that are part of the programme, with painting and fixing doors and windows top of the list. If you’re an enthusiastic cook, we’d love you to prepare a meal for homework club children to eat after school (30 children), or for a foster family (10 people).